On May 5, 840, it was said the Sun vanished out of the sky for over five minutes. As the story goes, the son of the revered emperor Charlemagne, Louis of Bavaria, witnessed the event with such fear, that when the Sun reemerged back into view, he was so overwhelmed he died of fright! Soon after, his three brothers fought to succeed him, only to end with the Treaty of Verdun, dividing Europe into the areas that we know today as Italy, Germany, and France. It was a day to be remembered, which affected the course of history. Many years later, during the total solar eclipse of 1919, Sir Arthur Eddington performed the first experimental test of Albert Einstein’s theory of general relativity. These findings turned Einstein into an overnight celebrity and sparked the eventual triumph of general relativity over classical Newtonian physics. On May 29, 1919, Einstein’s theory was accepted. This surely was a noteworthy marker in human history — once again overseen by an eclipse. Then there are the surprises, when eclipses are uneventful. Do you remember the End of the Millennium eclipse on August 11, 1999? This event was suggested to be a sign for some kind of catastrophe, but nothing major came from it. A sky filled with the potential of magic. So what exactly is a lunar eclipse? As you know, the Moon orbits the Earth, and the Earth orbits the Sun. Every once in awhile — at least twice a year, to be exact — Earth lines up directly between the Sun and the Moon, blocking the light to the Moon which causes an eclipse. During this, we can see Earth’s shadow on the Moon. Lunar eclipses always speak to duality, because the Sun is in one sign, and the Moon is in its opposite. During a lunar eclipse, we are asked to look behind at what is unfinished and needs attention. 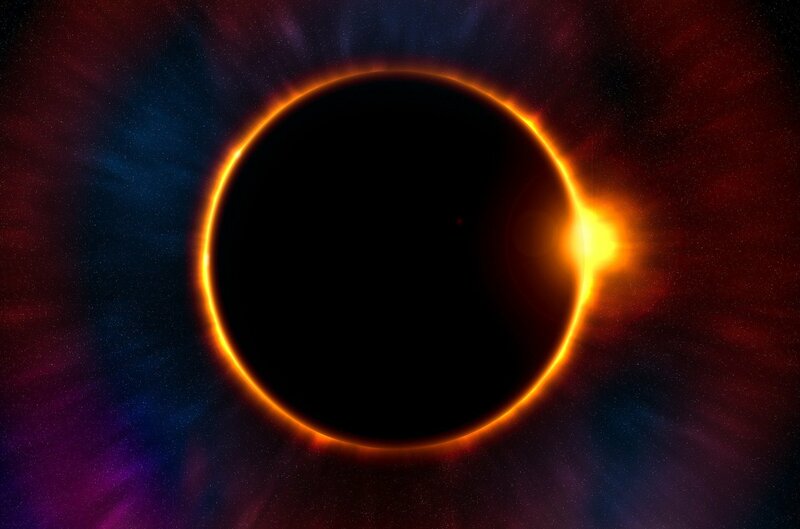 The Solar eclipse that follows on August 21, will often bring a stronger impact. This time, the Moon stands between the Earth and the Sun, in the same astrology sign (also known as a new moon), turning off the sunlight for a few moments. We are then in the dark, forcing us to look ahead. Eclipse seasons, in history’s eyes, have always seemed overwhelming and frightening…but not anymore. Now with our modern eyes, we know that eclipses can bring a time of strength and purpose. We are exchanging the fear-based tales of old for fresh new perspectives. In fact, my Applied Astrology classes are an attempt to freshen up stale ways of seeing ourselves and the world. Astrology is meant to help us cultivate compassion and wisdom…not to scare us or glue us to what is supposedly “written in the stars” as an unmovable fact. You don’t have to be Einstein or royalty to harness the energy of August’s eclipses. All you have to do is learn astrology, so you can become your own inner guidance system, who is honest and able to do a prayer with meaning and follow-through. I would love to hear how this eclipse affects you. Leave me a comment and tell me what you notice about yourself and your world.